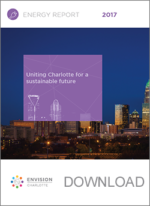 Envision Charlotte was established as a 501(c)3 in 2011 focused on economic development through sustainability. Envision Charlotte’s first initiative was in partnership with Duke Energy focused on reducing energy in our Center City. Charlotte’s uptown has 64 buildings with 10,000 square feet or more of commercial space and 61 of those buildings signed an energy pledge to reduce their energy by 20%, put a shadow meters in their building and a kiosk in the lobby showing the aggregate energy use of all the buildings. Smart Energy in Offices is a program that drives energy efficiency savings with community-focused collaboration of building management, tenants, and occupants. Through unique engagement strategies we focus on simple everyday changes anyone can make to help save energy in the office space. Energy use is the single largest operating expense in buildings, accounting for about a third of all building expenses. This energy use drives 20% of all greenhouse gas emissions, yet it turns out that about a third of that energy is wasted according to US government data. Building owners can increase their profitability by taking simple steps to reduce consumption. Energy Star calculates that a 10 percent decrease in energy use could lead to a 1.5 percent increase in net operating income while reducing their environmental impact and improving tenant satisfaction. Measure and track your energy performance. The old business adage of “what gets measured gets done” is true; simply knowing your costs and consumption levels will help drive positive change. Turn off lights when not in use, and even when natural daylight can be used. You will be surprised how quickly your bills will lower when you take this simple step. Set back the thermostat in the evenings and other times when a building is unoccupied. You might think you’re already doing this but an operational audit will likely show places you can make changes. Educate tenants and employees about how their behaviors affect energy use. Your tenants will want to participate so they can reduce their environmental footprint and also reduce their operating expenses. Check out our Champion Program pages to learn more. Improve operations and maintenance practices by regularly checking and maintaining equipment to ensure it is functioning efficiently. Optimize start-up time, power-down time, and equipment sequencing. Revise janitorial practices to reduce the hours that lights are turned on each day. This change is especially important at night, as many janitorial companies leave whole floors lit long before and after they are cleaned.